In June, Archives staff settled into the Silent Reading Room just along the corridor and we expect to be here for several weeks. Refurbishment work continues on Floor 02 and the builders have gone to great lengths in safeguarding our equipment and the collections, even installing temporary walls and doors. Further details on the temporary closure of Archives. UEA students have been consulting Tash Aw’s Archive and Doris Lessing’s correspondence. 10 PhD students of creative writing, literature, history, languages and linguistics attended our joint British Archive for Contemporary Writing and East Anglian Film Archives workshop at the CHASE Encounters Conference held at UEA on 29 and 30 June.The workshop highlighted the opportunities and challenges of using film and literary Archive material for research and teaching, as well as the day to day role of the Archivist and the future challenge for archives in managing born digital material. Students were provided with hands on access to copies of unique archive material to help simulate the process of independent archive research. This provoked some interesting discussion, particularly amongst creative writers who were prompted to consider their own archive material. • We are preparing materials for an external exhibition to be held in 2018/19. • The collection is being used by a writer as the basis for her work of fiction. One user is researching for a book on Lawn Road Flats and artists of the 1930s; another is writing a book on art, design and science. Other enquiries related to the Pritchard family tree; and to Walter Gropius’ farewell dinner guest list from 1937. Users are reminded that the BBC recording of Cigarette on the Waveney is publicly available online (a tranquil documentary of Deakin’s trip down the River Waveney in a white canoe). For UEA members, his recordings of The House and The Garden are available on Box of Broadcasts. Malcolm Bradbury’s large magazine and newspaper archive has been accessed by a visiting academic in LDC (School of Literature, Drama and Creative Writing). The collection has been accessed for the correspondence of Lord Zuckerman, Lord Mountbatten and Margaret Thatcher; and for architectural drawings of German and Italian buildings held within WWII bombing reports. A valuable addition to the collection has been a limited facsimile edition of Robert Rauschenberg‘s 34 illustrations after Dante’s Inferno. Produced by New York’s Museum of Modern Art and presented in a grey clothbound clamshell box, it includes the trade publication. Rauschenberg’s series of drawings from 1958–60 are each reproduced at actual size on individual sheets; a drawing for each Canto of Dante’s poem. A copy of the trade publication is on order for the Library’s open shelves. There were 12 enquiries for Special Collections. Since researchers have been taking a keen interest, we think it’s time for us to take a closer look too. The two albums of sepia photographs of the Old Masters, are believed to have been once owned by the English poet and painter, Dante Gabriel Rossetti (1828-1882). The ‘photographs’ are imprints on rather fragile pieces of paper. They are loosely inserted in the album, some are embossed on the back giving clues of the photographer (J. Laurent, Madrid) or the name of the exhibiting gallery (Cuadros Del RL. Museo). They show paintings by Velázquez, Lopez, Luini, Rafael, Giolfino, Da Vinci, etc. 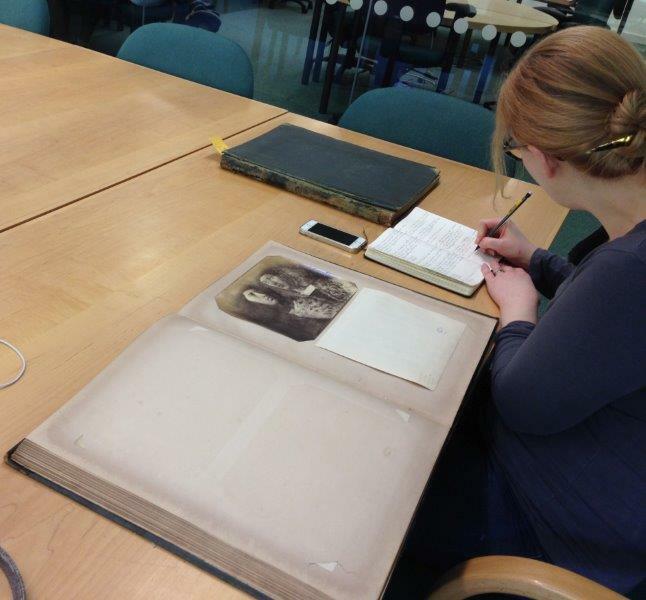 Researchers are focussed on the provenance of the albums; whether they inform on the cultural dialogue which Rossetti may have had with the Italian Renaissance; and their journey to UEA Special Collections. Perhaps this is a case of provenance triumphing over product. The ‘photographs’ are flimsy, they may have been printed in fair numbers and it’s the sort of thing we nowadays might expect to pick up in a museum shop. We believe that the albums then came into the hands of the collector Claude Colleer Abbott (1889-1971). Abbott bequeathed his library of 1,500 items to UEA. He was interested in the Rossetti family and amongst his papers lodged at Durham University are 37 letters between Rossetti and F.J. Shields. Most recently the albums were consulted in Special Collections by a researcher from Richmond, Virginia. Special Collections are all catalogued in UEA Library Search and are open to all (by appointment).